Texas Poet Laureate-elect Larry D. Thomas, the second person with that title to have a Sam Houston State University connection, said the university's Texas Review Press has been a lifesaver to Texas poetry. “The fact is that Texas Review Press, an adjunct of the English department at Sam Houston State University, is in large part responsible for keeping poetry alive and thriving in this state,” said Thomas. The Texas Review Press impact is felt outside the state as well, he said. This past April Thomas, who lives and works in Houston, was appointed by the Texas Legislature as the 2008 Texas poet laureate. His term begins in April 2008.
last year was chosen by the Montgomery County Commissioners as Montgomery County poet laureate, a position he will hold until 2010. Thomas has written and published poetry for more than 30 years. Until he retired in 1998 from his 31-year career in social service and adult criminal justice, he wrote only on weekends. Since 1998 he has been a full-time poet, writing in a small studio located behind his home in Houston, where he lives with his wife, Lisa. subsequently became a regular contributor of poetry to a number of other distinguished national literary journals, including the Midwest Quarterly, Louisiana Literature, Poetry Depth Quarterly (California), Fort Worth’s Journal of Poetry and Fiction, Concho River Review, RE:AL: The Journal of Liberal Arts, Borderlands: Texas Poetry Review, Sulphur River Literary Review, Southwestern American Literature and Windhover. Award from the National Cowboy & Western Heritage Museum, one of the most prestigious literary awards in the nation granted annually for a book of poetry which celebrates the historical or contemporary West. In 2004,Texas Review Press published his second book-length collection of poetry, Where Skulls Speak Wind, as winner of the 2004 Texas Review Poetry Prize. Where Skulls Speak Wind subsequently received the 2004 Violet Crown Book Award sponsored by the Writers’ League of Texas and Barnes and Noble Booksellers, one of the top literary awards in Texas granted for a book of poems published within a 12-month period. Additional literary honors garnered by Thomas include two Pushcart Prize nominations, a Poet’s Prize nomination (Nicholas Roerich Museum), three Spur Award Finalist citations (Western Writers of America), and designation by Barnes and Noble Booksellers in June 2002 as the Houston area author of the month. 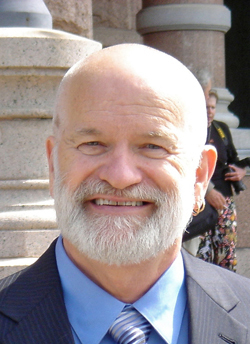 throughout the state during his tenure as the 2008 Texas poet laureate. late 2007) and New and Selected Poems (TCU Press, April 2008).